Event backdrop (of pipe and drape) arrangement is always not a easy thing. We provide different length and height of pipe stand to clients reference, also various material and colors curtain drapes for chose. The basic set for backdrop is upright+crossbar+base+ceiling drape. Adjustable upright in size 3-5ft, 6-10ft, 7-12ft, 8-14ft, 9-16ft and some higher size 7' - 17', 8' - 20', 9' - 23', while telescopic pole crossbar in length 6-10ft, 7-12ft, 8-14ft, 9-16ft, all these sizes provide alternative solution for event planners. Base we have 18" × 18" and 24" × 24", for height less than 14ft, using 18" × 18" is no problem. Roundness canopy is very popular in Western style wedding. It's a symbol of elegance and nobility. Event planner combine creative idea with backdrop, they always set up many beautiful backdrops. For the round tent, we normally customize size according to the diameter, like 4ft, 5ft, 6ft, 8ft, 10ft, 12ft and 14ft. Here is a top ceiling design project from our client. 4 arches crossbar stand build 12ft diameter round tent, 4 pieces 9-16ft uprights, 4pieces 24" × 24" bases and a little treatment on the chiffon drapes. For the curtains, we have these colors white, red, pink, yellow and so on, All these can set up a wonderful wedding for you. 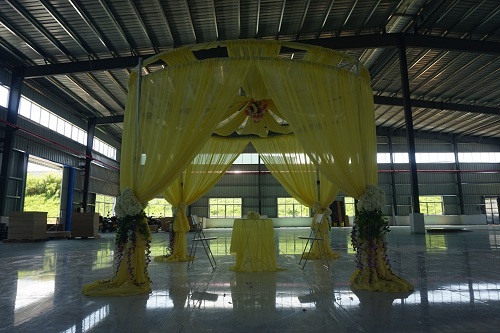 If you have more coming event needed our pipe drape, welcome to contact us.